During the height of the crack epidemic that decimated the streets of D.C., Ruben Castaneda covered the crime beat for the Washington Post. The first in his family to graduate from college, he had landed a job at one of the country's premier newspapers. But his apparent success masked a devastating secret: he was a crack addict. Even as he covered the drug-fueled violence that was destroying the c… ity, he was prowling S Street, a 24/7 open-air crack market, during his off hours, looking for his next fix. 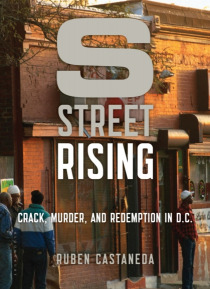 Castaneda's remarkable book, S Street Rising, is more than a memoir; it's a portrait of a city in crisis. It's the adrenalin-infused story of the street where Castaneda quickly became a regular, and where a fledgling church led by a charismatic and streetwise pastorwas protected by the local drug kingpin, a dangerous man who followed an old-school code of honor. It's the story of Castaneda's friendship with an exceptional police homicide commander whose career was derailed when he ran afoul of Mayor Marion Barry and his political cronies. And it's a study of the city itself as it tried to rise above the bloody crack epidemic and the corrosive politics of the Barry era. S Street Rising is The Wire meets the Oscar-winning movie Crash. And it's all true.